Ken Kelly is charming. He exudes a kind humour that is alien in the languid air of the holding room of the emergency department at Halifax’s Queen Elizabeth II Health Sciences Centre. In a stream of hunched shoulders and demoralized faces, he stands out. People sit in the chairs across from him and close their eyes, as if willing time to speed up. He asks each one how long they’ve been waiting and how they’re feeling. In his lap sits a folded up piece of paper with a pen clipped to it. On it, he jots down the names and topics of conversation he has with people he has come across that night. He refers to it when he talks about people he has met, double-checking names and little details, almost as if it would be disrespectful to make a mistake. He had come from Ash Wednesday mass that night, the faint smudge on his forehead barely visible at the late hour. His voice cut through the uncomfortable stillness in the room. “You almost need an icebreaker,” Kelly, 69, recalls later, his smile somehow evident through the phone. That night, he told every patient he spoke to that he hoped they would get the “tall Dr. Andrew,” the nice doctor who is ever so helpful. Kelly was not feeling well for about a week and finally decided it was time for a trip to the emergency department. Later that night, he was told he had heart arrhythmia, a condition that causes irregularity in heartbeat. He was at the hospital for about seven hours that night. He is now scheduled for cardiologist appointments to treat his condition and he’s still seeking treatment options. 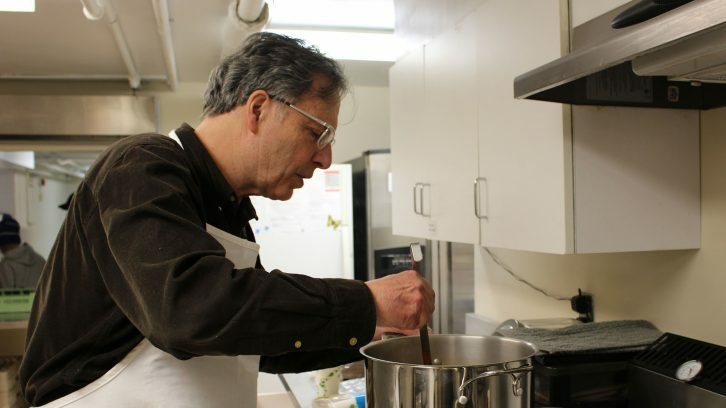 This, however, does not stop him from volunteering every week to serve food to the underprivileged at the St. Mary’s Basilica. Everybody seems to have an emergency horror story. A long wait in pain in some waiting room somewhere with fluorescent lights and leather chairs that are just a little too uncomfortable for hours of habitation. Patients wait far longer than the times the guidelines dictate for emergency care, from 15 minutes to two hours. Many are braced for the long wait: they come equipped with laptops, knitting and books. Recently, Cobequid Community Health Centre in Lower Sackville had to remain open past its midnight closure time to care for patients who needed to be hospitalized but couldn’t be, because of a lack of beds. That’s what it comes down to: a rocky flow and a huge clog that sits in one’s memory, darkening their view of the health-care system. In mid-March, nurses at the Halifax Infirmary emergency department called for a Code Orange, a code usually reserved for events with mass casualties, but their request was denied. The Nova Scotia Government and General Employees Union stated there were three fewer nurses working in the emergency department than were required, and 99 patients waiting to be seen. But the frustration does not end in the waiting room. The fight for attention runs throughout the entire emergency department of the hospital, deeply ingrained in the DNA of a system that is heavily relied upon. For Dr. Sam Campbell, every day is a never-ending search for space. 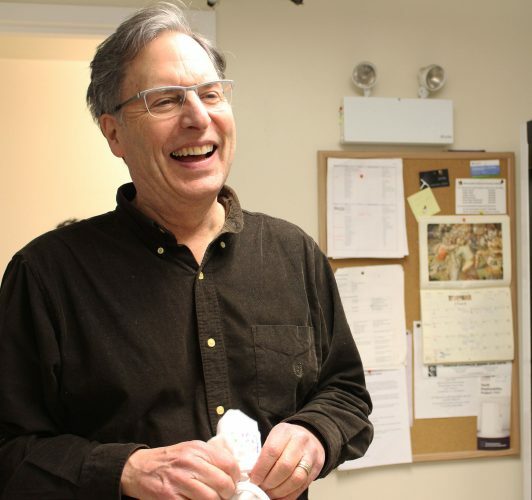 He has been working in Halifax as an emergency physician since 1996 and his passion for his work is palpable. He walks through the maze of pods, little sections in the department, with purpose and determination. His stride is brisk and anyone else would have to jog to keep up with his long legs. It is easy to see why he is an emergency doctor. He marches through hallways filled with patients waiting for beds, taking sharp turns into other hallways filled with more patients and more waiting. Around him are stretchers, each with a patient and equipped with its own paramedic, who is unable to leave until the patient has been admitted. This, he says, is not unusual. The union for Nova Scotia paramedics said earlier this month that paramedics are overworked and exhausted, partly due to long waits to hand over patients. The Nova Scotia Health Authority is working on a policy to set time limits for offload times for ambulances. Simply put, there are too many swimmers and not enough water. Emergency departments are no longer being used as emergency departments. They have become an extension of other hospital facilities, with patients staying past their emergency needs. This jams the whole system: patients cannot be moved fast enough to where they need to go. Emergency doctors and physicians are left to make do with what they’ve got and usually, it’s not enough. Nova Scotia’s emergency wait times are similar to Ontario’s. However, Nova Scotia’s health authority has been implementing ways to increase efficiencies in emergency departments. A part of these plans has been giving nurses the power to send patients for electrocardiograms, also known as EKGs when a patient comes in with chest pain. This means that when the patient is then seen by a doctor, the doctor already has the test results, speeding up the process. Dr. Campbell takes his opportunities when he sees them: any bed on the floor is fair game for him to treat patients. It’s a never-ending battle. He looks at a screen in the hub of the pod and lets out a humourless laugh. A patient has been waiting nine hours with chest pain and has yet to be seen. He says he will probably see him in Pod 5, despite the fact that he should be treated in different pod with more monitors. There just isn’t any space. The Canadian Triage and Acuity Scale, more commonly referred to as CTAS, is the measure used to determine the order in which people are seen by physicians. Upon arriving at an emergency department, patients are first seen by a triage nurse. The nurse speaks to them, checks their vital signs and assigns a CTAS score. The scale runs from one to five: from resuscitation (one) to non-urgent (five). Five would be symptoms such as a sore throat, or a simple suture – a patient who could wait for two hours to be treated. Level four is “less urgent” and would include things like a sprained ankle: something that needs medical attention but is not life-threatening. The timeline for a person under CTAS four would be seeing a physician within an hour. The third, “urgent,” is slightly more tricky: illnesses that are not life-threatening but could become life threatening. Level three patients must be seen within 30 minutes based on the guidelines. Level two is “emergent” and patients who will absolutely become more ill if they are not treated. An example of this is chest pain or signs of stroke. These patients should be seen within 15 to 30 minutes of being triaged. And last and most serious is level one: resuscitation. These are patients, in most case arriving by ambulance, who are unresponsive and in life-threatening danger. Obviously, they require immediate care. These times are the national standard, but the reality does not match up. Amanda Beaver was a CTAS 3 patient. She was a like a veteran of the waiting room that night. People around her would tell you she had been there for 11 hours, as if she were a cautionary tale. A “turn back if you can” sign. Beside her sat a frustrated teenage boy. He periodically got up to talk to the nurses, asking each time how long it would take for his mother to be seen. They didn’t know. She sat in the corner on a leather chair, her feet propped up on another chair facing her. The dark circles under her eyes stood out against her sallow skin. She rarely talked. To her right was a decorative fireplace filled with white stones. It provided no heat. The tepid air in the room filled with excited energy as a nurse with a clipboard walked in from behind glass doors – everyone knew the nurse is about to call a name. Some told Beaver they hoped it would be her name. Eleven hours in, a nurse finally did call her name. Patients around her filled with hope: they could be next. Later that night, she was told she had severe dehydration and mild kidney failure. She recalls Dr. Andrew, the heroic doctor with the glowing reputation, apologizing to her for the wait. Beaver and the rest of the beleaguered patients didn’t know what was happening on the other side of the glass walls: physicians and nurses scrambling to find a somewhere, anywhere, to put them. Physicians feel almost helpless. The problem is out of their control: they cannot move a patient to another hospital department to free up a bed until the patient has someplace to go. Pod 5 is a the place with people with a CTAS score of 5 are taken. It’s designed for quick fixes: a couple of stitches here, a cast taken off there. It is not equipped for patients with more serious conditions, such as chest pain. Yet Dr. Campbell finds himself having to treat more and more patients in the area simply because it’s better to see them somewhere than not at all. What is desperately needed are long-term spaces for patients to be moved to for the department to move like a well-oiled machine. Dr. Campbell believes that until other departments can feel the pressure of the lack of beds, nothing is likely to change. 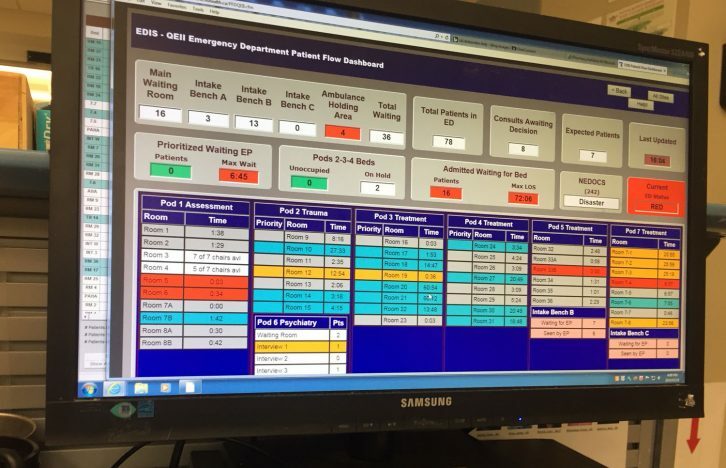 If someone has 10 in-patient beds but there are 15 people that need that bed, there is no pressure on the department to empty beds or find an alternative place to put those patients. The burden of long-term care for the extra five people is placed on the emergency department. Penney, citing the most up-to-date statistics, said 90 per cent of the time patients who came into the emergency department at the Halifax Infirmary and needed to be admitted, waited for 37 hours to be moved to an inpatient bed or to another area of the hospital. This is from the time they were triaged to the time that they are moved out of the emergency department to another bed. “It starts to decrease your capacity for things that are outside of your control,” says Penney about the long inpatient admission time. The accountability is placed on emergency department staff who have zero ability to fix the problem. They are left on most days with less than one-third of their beds available, because the rest are occupied by people who are no longer in an emergency or require emergency care. It is not just the area that is ill-equipped to care for patients past their emergency needs, but the physicians, too. 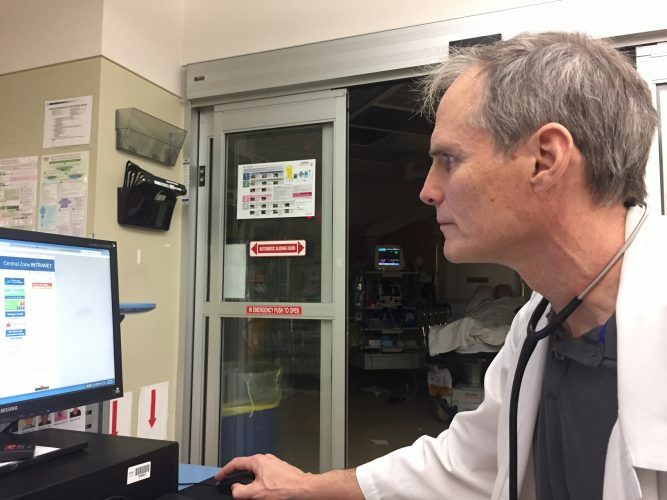 Physicians and nurses in emergency departments are specialized in emergency medicine: they have little knowledge about long-term or primary-care issues. “People still somehow think that an emergency physician is a doctor is a doctor is a doctor,” says Dr. Campbell. This system takes a toll on everyone it touches: doctors are left exhausted and frustrated, nurses often burnout, patients give up and leave, often after half a day, with bad memories and their own emergency story. Kelly tells his story later with a few laughs and many honourable mentions of Dr. Andrew. Unfortunately, his emergency story is not quite at an end. It isn’t one of just horror and frustration, either. Kelly tells tales of patients past who have had it worse: the one with strep throat – incredible young woman, he says, who was raised by two deaf parents. Or the nice man who had been coughing up blood but wasn’t seen for hours. Kelly says he had started to worry about him. And did anyone else meet the sweet mother and daughter who had been there earlier? Kelly sits and Kelly talks and Kelly brings a tiny reprieve in a gloomy day. I don’t really see that “abuse” spread out evenly. I know people often have to fight for what they’re entitled to. I have the privilege of knowing Ken Kelly well. He is one of the most compassionate, caring human beings I know on this earth, and it’s wonderful to see him featured here. A comment on the multidisciplinary team working in the Emergency Department: many EDs (including the QEII), patients are triaged by either a paramedic or a nurse. Also, Pod 5, the “minor treatment” area sees patients of CTAS levels 5 through 2 and is staffed by paramedics. As a hospital employee i know that a lot of the health care problems come from employee sick time. There are too many abusers and the system allows it. No these people do not call in sick because they are over worked. We get paid for sick days and we get a ton of them. For example we get 15 sick days but if you call in sick for 10 in a row you are only using 3 sick days because the 4th to the 10th day are considered short term illness and it does not com out of your sick time. People will do this many times a year. I dread when April comes because that is when our sick banks get filled up again. The abuse is rampant in all areas of the hospital. In our booking office we have now 3 people off on short term illness, they will come back after a few months and then do it again. The management just isn’t tough enough on these abusers because they have too much paper work to complete to start a discipline plan. The abuse is what is ruining health care. Be careful what you say. Until you actually know what goes on in these coworkers lives then be careful to judge. It is easy to make assumptions when it seems that you are picking up the slack short handed. This is in many professions. Is there some abuse, probably so, but don’t be too quick to judge as it seems suicides in health care is on the rise. I’ve worked in health care over 40 yrs and I totally agree with Debbie’s comments. Well said. This a very interesting perspective, however, it is not true for ALL areas. Perhaps this one area (which based on the language isn’t involved in direct patient care – 15 sick days only in areas that work 7.5 hour days. Nurses get 10 shifts if full time) has an issue, the reasons for which could be many, including those related to the unit itself (poor working conditions, perhaps?) Maybe the building is the Bethune, where the air quality and ventilation is so poor illness is a certainty in cold/flu season? Maybe there is an employee who makes the conditions so toxic for everyone, the need for a mental health break is overwhelming? STI also requires a physicians assessment and approval from a benefits coordinator. It doesn’t just happen automatically. Painting the whole of health Care as lazy and abusive to their benefits when it’s not true is actually rather detrimental to solving the actual issues in our health Care system. Wow Debbie, that is quite a blanket statement. I am a nurse and I have had four periods of STI in over 20 years – two for maternity leaves and two when I was very ill. I dont see my colleagues abusing sick time as you say. That is not an accurate reflection of employee sick time Debbie. Maybe in the area where you work there are some bad apples but i have worked in several areas of CDHA and IWK – people generally do not abuse their sick time maybe 1 or 2 on a unit. THIS IS NOT WHY HEALTHCARE IS SUFFERING!!! This generalization is ignorant! That is a ridiculous and untrue statement. Do you actually believe what you wrote? Why do you call it abuse? Stressed health care professionals need mental health days as much as sick days. The bureaucrats have designed a system whereby only people in full time positions get benefits. If everyone, from casual and part time were acknowledged to be contributing to the system, and had a proportion of benefits according to hours worked, then there would be less need to call in “sick” just to get relief from the mentally as well as physically-draining labour. Maybe setting up non-emergency but urgent care clinics to serve longer hours than the current clinics, and hiring more personnel, and employing nurse practitioners, and having practical nurses take over from the ambulance drivers, would smooth out this distressing situation.